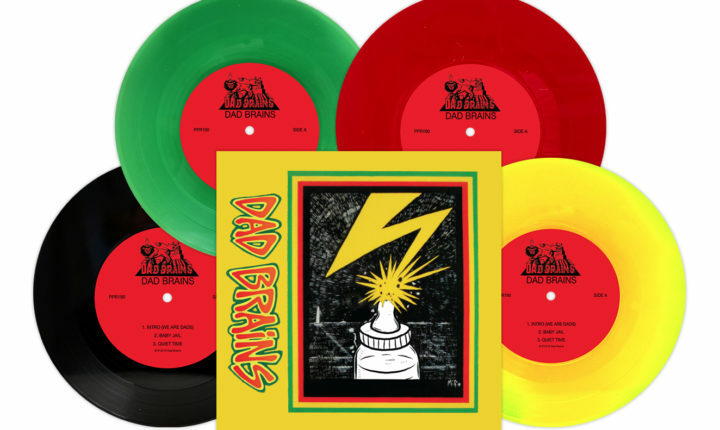 A deeper look at the grooves pressed into EP by Dad Brains. Now over forty years since it first appeared, it was inevitable that punk rock was probably going to take on something that resembled a fatherly voice, somehow. How could it not? With Green Day having made concept records already and both Fat Mike Burkett and Mike Watt having produced punk rock opera albums, punk and its pillars have already begun taking on “grown up projects” (or at least more “adult leaning” ones) and endeavoring to look and sound older, so the possibility of finding bands who take that aspect as keystone to their music can’t really be that surprising, right? The notion of punk growing up might seem like a bit of a reach but it’s still possible. Questioning authority is largely a teenage pastime – but Dad Brains have found a way to balance the snotty frustration which is keystone to punk rock’s modus operandi with the responsibilities normally associated with parenthood (and, by extension, with adulthood). It’s a little silly and a little sophomoric, but hey – so are most punk rockers AND most parents. After an “Intro” takes a minute to check all the levels for the recording and lets singer Pat Pedraza introduce the proceedings as well as what to expect from it (the couplet “We are Dads – so proud to be/ We are Dads – don’t mess with me” performed in a very throaty whine about sum it up), Dad Brains launch into the full-on minute-long tirade that is “Baby Jail” with such ferocious passion that even those expecting it will be launched off-balance. With speed and power in the vein of the band from which Dad Brains take their name (Bad Brains – for the utterly clueless), the band doesn’t hold bac or even sort of in a sense of self-preservation; the guitars in the song are diamond-hard and completely unrelenting, the bass is nearly inaudible and the drums function at a break-neck speed – all of which supports Pedraza’s manic vocal tone perfectly. Here, Pedraza splits the difference between “silly” and “severe” by opening both his eyes and his mouth wide and delivering his vocals both like a lunatic and like a guy trying to make his kids laugh as he does it. There’s no question that the song is fluffy and a little silly, but it serves the purpose of introducing the band and sets up the slightly-more-significant follow-up track, “Baby Jail” (a solid screamer about either doorway barricades or playpens – I’m not sure which) in a manner which ensures that listeners will be primed and ready for it. That, by extension, lines up the designer-impostor Black Flag ear-bleeder “Quiet Time” (which could just as easily have been called “Nap Time” as it tells the story of a mother trying to get her child down so she can get a moment’s rest – a desire which goes denied) to both close the side and leave listeners anxiously hungry for more. EP is out now. Buy it here, directly from Pirates Press Records.